Yarhi, Eli and Robert J. Jackson. "Member of Parliament (MP)". The Canadian Encyclopedia, 08 August 2017, Historica Canada. https://www.thecanadianencyclopedia.ca/en/article/member-of-parliament. Accessed 20 April 2019. The term Member of Parliament (MP) refers to individuals elected to represent a single federal electoral district (or “riding”) in the House of Commons. As elected representatives, MPs have three main duties: legislating in Parliament, representing their riding and political party, and serving their constituents’ needs. MPs occupy different roles and levels of influence in government. They hold office until Parliament is dissolved — typically four year terms — and can serve infinite mandates, so long as they are re-elected. Any Canadian citizen who is at least 18 years old on election day can run for office. Most MPs are elected as a member of a political party, but some may campaign and sit as independents. There are 338 seats for Members of Parliament in the House of Commons. ​What do Members of Parliament Do? MPs have three major responsibilities: legislating in Parliament, representing their riding and political party, and serving their constituents’ needs. Policymaking is the domain of Cabinet, its ministers and the senior public service; MPs as a group have less effect in policy formation, although some MPs claim a strong voice in caucus and in committees. Part of an MP’s representative role is responding to the grievances of constituents. MPs are elected to represent the interests of the people in their constituencies — where they maintain an office. 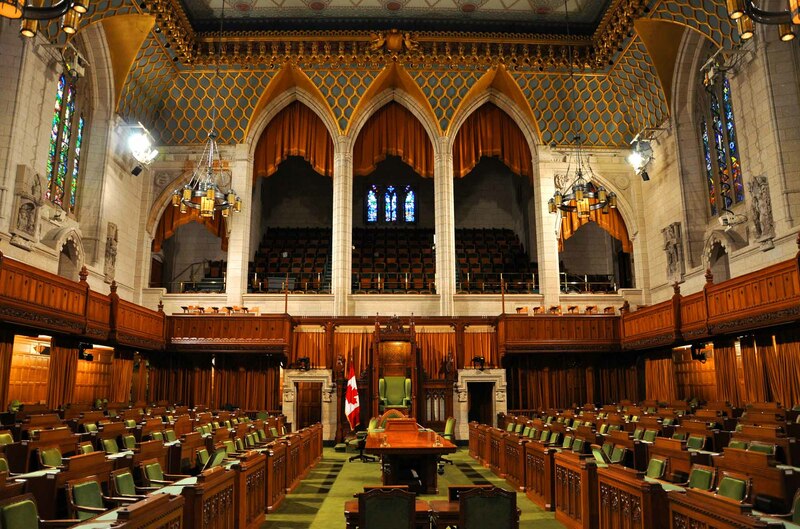 As representatives, MPs propose, debate and vote on legislation, engage in committee work, speak on matters of local, regional and national importance in the House of Commons (and during caucus meetings), and ask questions of the prime minister and of Cabinet ministers when Parliament is in session. They also review government spending estimates and vote on federal budgets. Members of Parliament occupy different roles and levels of influence in government. Members can be assigned or elected to a variety of positions, including speaker, house leader, party whip, committee chair, Cabinet minister or opposition critic. Members of Parliament are paid public servants whose yearly salary starts at $170,400. Members with additional responsibilities (including the prime minister and the positions listed above) earn higher salaries as well as additional perks such as a car allowance. The prime minister is the head of the federal government, but he or she is also an elected Member of Parliament. In the party system, the leader of the party with the most support in the House of Commons normally becomes prime minister — people are not specifically elected to the position. Party leaders can become prime minister even if they are not an MP (e.g., John Turner spent most of his term as prime minister outside of Commons); however, convention would urge them to seek a seat in a general election or a by-election. The prime minister sets policy direction, manages government, directs and appoints Cabinet, meets with foreign delegations and answers questions — from opposition members and sometimes from backbenchers in his or her party — when Parliament is in session. The prime minister and Cabinet must maintain the support (or confidence) of the majority of MPs in the house in order to govern. Certain members — traditionally from the party holding the most seats in the House of Commons, but not always — are appointed to Cabinet, the committee of ministers that holds executive power. Most Cabinet ministers are the formal head of one or more government ministries. Those ministries often include safety, health, employment, defence, environment, Indigenous and northern affairs, natural resources, economic development, immigration, agriculture, transportation, tourism, foreign affairs, justice, intergovernmental affairs and finance, among others. Ministers set departmental priorities, draft public policy, serve on committees and propose legislation. In the party system, opposition parties form what are known as “shadow Cabinets,” which mirror Cabinet. Shadow ministers (generally referred to as opposition critics) hold the government to account, offering alternative policy, and expressing their party’s position and message. Members who are not in Cabinet are known by the term backbencher because they historically sat on a bench in the back of Parliament. Principal work for all backbench members is providing services to constituents; policy making in conjunction with the party caucus; and being members of various committees reviewing legislation. This map references the number of federal electoral districts, or "ridings," in each province and territory. There are 338 districts in total, representing as many seats in the House of Commons. Any Canadian citizen who is at least 18 years old on election day can run for office. Virtually all MPs are elected as a member of a political party, but some may campaign or sit as independents. MPs generally possess a high level of education. After the 2015 election, 227 MPs had bachelor’s degrees, 97 had master’s degrees and 14 had PhDs. Many are elected to serve in the federal government after serving in provincial, territorial or municipal government. Many others enter politics from the private sector. Common professions include careers in business, law, consultancy, teaching and journalism. MPs are mostly male (74 per cent) and middle-aged (on average, 51 years old). Their careers are usually short-lived — on average, eight years, or two terms — due to shifting electoral behaviour. In 2015, 11 Indigenous people (6 First Nation, 3 Métis and 2 Inuit) were elected to the House of Commons. Forty-one MPs were born outside of Canada. At least 46 people of colour (people who are not White or of European ancestry) were elected in 2015 — accounting for 13.6 per cent of seats, a jump from 28 people of colour elected in 2011, representing 9.1 per cent of seats. Data shows that the percentage of people of colour in Parliament has increased at a slow pace since 1993. According to the 2011 National Household Survey, 19.1 per cent of the Canadian population are people of colour. The number of women candidates who ran in federal elections increased from 373 in 2000 to 533 in 2015. However, the percentage of women candidates elected as MPs remained at about 16 per cent during the same period. As of early 2017, there were 88 women in the House of Commons, accounting for just over 26 per cent of seats. First Women in Provincial and Territorial LegislaturesSee biographies and related resources about distinguished women political pioneers in Canada. Produced in recognition of Women's History Month. From Library and Archives Canada. Senators and Members Parliament of CanadaOfficial information source about current senators and Members of Parliament in Ottawa. Click on "The Ministry" for a list of current federal cabinet members. From the Parliament of Canada website.